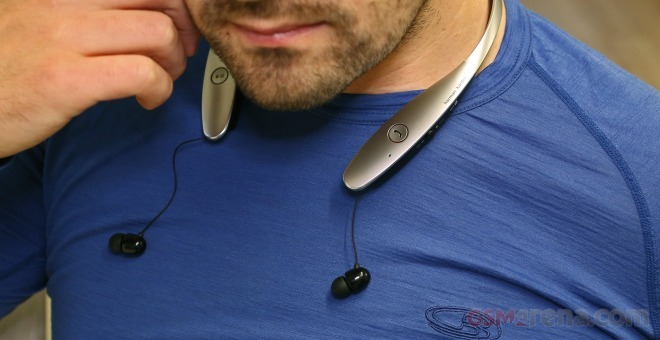 Join me as I take a brief look at this stereo Bluetooth headset in our latest flash review. 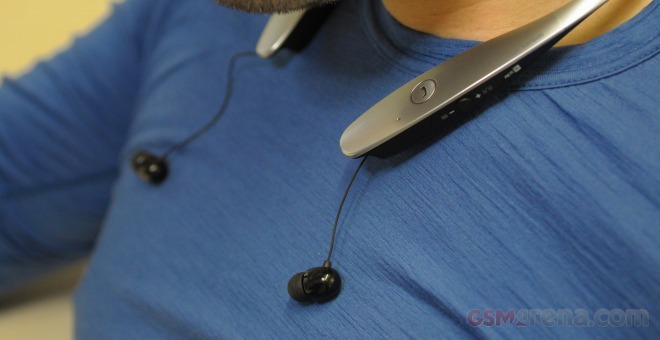 The LG Tone Infinim (HBS-900) follows LG trademark form factor where the headset itself is a plastic band, which sits around the neck. 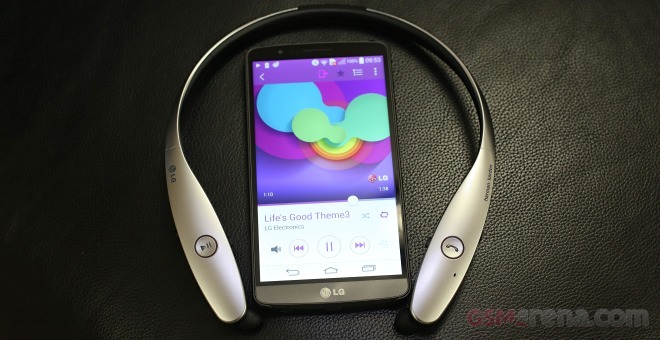 LG has a whole lineup of this type of headsets, but the Tone Infinim is easily the most expensive among them. The novel thing about it is that the earbuds cables are retractable at the push of a button. 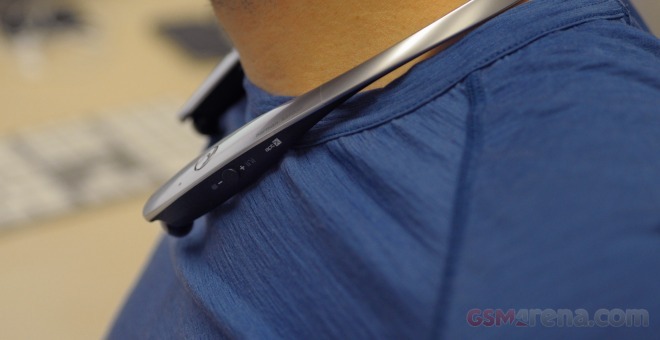 Even when they are not retracted all the way in, you can still attach them to the neck band via the built-in magnets just as you would on the other LG Bluetooth headsets. For now the Tone Infinim only comes in silver color with a smooth metal finish, but according to LG, there are plans for other colors in the future. The retail package includes the headset itself, a microUSB cable for charging, the manual and two sets of extra earbuds of varying sizes. The LG Tone Infinim (HBS-900) was announced along the LG G3 earlier this year and it offers some nice features, which are exclusive to this smartphone. When connected to G3, upon an incoming call, you have the option to hear the name or phone number of the person calling you. Another exclusive feature is that the call sound would automatically transfer to the phone’s earpiece as soon as you raise it to you ear. When I investigated the matter further however, it turned out that I was misled by LG’s product marketing. It was the smartphone that was responsible for these features to work, not the headset. So these tricks were just as readily available when using the LG Tone Ultra (HBS-800) with the LG G3. I didn’t have another Bluetooth headset handy to test the possibility of an even wider compatibility. 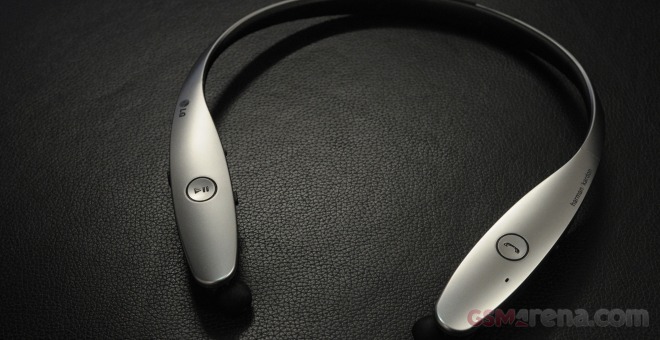 LG Tone Infinim (HBS-900) headset is Bluetooth 3.0 compatible. It’s also aptX-enabled, meaning that you get to enjoy the benefits of this low-latency audio codec if you use them with an aptX-enabled streaming device. Of course, the jury is still out on whether aptX delivers real-life improvements in Bluetooth streaming audio quality. I’ve been using the LG’s headset with both an iPhone 6, which doesn’t support aptX, and with the LG G3, which supports aptX, and I couldn’t find any fault with either streaming connection. Inside the LG Tone Infinim HBS-900 there is a 220mAh battery (as opposed to 195mAh in the Tone Ultra), which is said to be good for up to 17h of talk time or up to 14h of listening to music. The headset notifies you of calls and messages with mild vibrations. It would also vibrate if you stray far enough without your phone. The vibration alerts on the Tone Infinim can be turned off, unlike with the Tone Ultra. The Tone Infinim hardware controls are impeccable. The On/Off key is easier to operate than on my Tone Ultra and the new spring-loaded sliders for volume and playback control offer excellent user experience. The headset comes built-in audio equalizer preset – Bass Boost (default), Normal and Treble Boost, but of these three, only the Bass Boost preset alters the sound noticeably. Of course, all the sound presets on your phone’s music player work readily with Bluetooth headsets. LG quotes a 10h battery life of active usage for the HBS-800, which is much less than the 14h for HBS-900. The manufacturer’s claim seems to be in line with what I got out of it. The Tone Infinim lasted about 13h of non-stop music streaming in my battery test. It’s also rather quick to charge up (less than two hours). The wireless operating range of the Tone Infinim and Tone Ultra is about the same, too. Both headsets worked flawlessly within the 10m range quoted by the manufacturer. Of course, they need to be used within line of sight of the streaming device as Bluetooth doesn’t work well through solid objects such as walls or even doors. Just like any other LG Bluetooth headsets, the Tone Infinim would connect to up to two phones simultaneously (Multipoint), but the second phone will always remain secondary. When you turn on the headset in the morning, the primary phone will reconnect automatically, but the secondary one won’t and you would need to do the connection manually from the phone every time. What’s more, the window for connecting the secondary phone is limited. If you decide you need the second phone later through the day, you would need to power cycle the Bluetooth headset for it to accept it. Once both phones are connected, if you happen to get calls on both of them, a call waiting tone will signal you of the second call and you can easily answer it with a press of a single button, while putting the initial call on hold. In-call sound quality is very good and adequately loud. 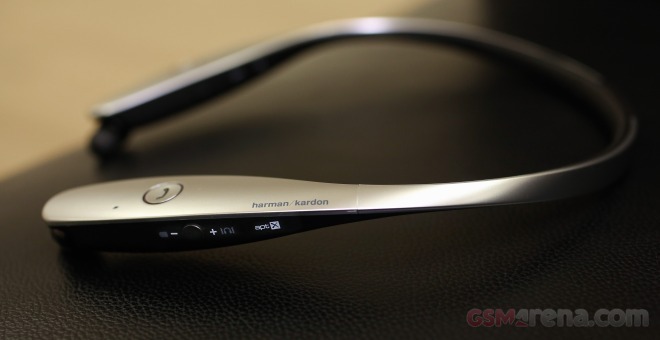 As for music streaming sound quality, I am quite happy with the harmon/kardon certified Tone Infinim. It has a nice and thick bass line and clear highs. Quite expectedly, the bass response varies immensely according to the rubber earbud used. The better it seals off the ear channel, the deeper the bass sounds. In direct comparison to the JBL-endorsed Tone Ultra, I couldn’t help but notice a few differences. Using one and the same streaming source and audio files (as well as one and the same size rubber earbuds), I noticed that the cheaper Tone Ultra clearly had deeper bass, but muddier highs. That’s not to say the Tone Infinim bass is not deep enough, it’s quite good actually, but the Tone Ultra’s is just more powerful. The highs on the Tone Infinim are better pronounced and closer to real life. The Tone Infinim headset is also noticeably louder than the Tone Ultra at maximum volume. My sound level meter measured it at 105dB maximum loudness, while the Tone Ultra’s maximum loudness is 100dB. Of course, listening to music at these sound levels for longer periods of time is damaging to your ears, so having a louder headset is not necessarily going to make any difference for you. Also listening to music at the maximum loudness level on the LG Tone Infinim with less-than-top-quality sound tracks is not pleasing as you can clearly hear clipping and sound distortion. But I guess, the higher maximum loudness would come in handy with quieter sound sources so it’s nice to have it if you use it responsibly. LG provides a really nice Android companion app, which enhances the capabilities of its LG Tone headsets. It’s called Tone and Talk and you can find it on the Play Store for free. The nice thing about it is that it is not exclusive to LG phones. Of course, you don’t have to use or even install the app to use and enjoy the headset. One of the best things about this headset is the ease of use and convenience of the form factor. I also love the voice prompt feedback about the battery level and the connection status. Of course, these aspects are also valid for the other headsets in the LG Tone lineup and those are noticeably cheaper. The Tone Infinim’s highlights are its retractable earbuds. Besides that, it has great build quality and a solid feel. Furthermore, the usability of the on-board controls is superior to the ones on the Tone Ultra (HBS-800). Of course, the streaming audio quality on the LG Tone Infinim is also great and this is what counts the most in any headset. Unfortunately, I am not convinced that excellent in this case means superior. From a user’s point of view, the Tone Infinim rigid neck band left me with underwhelming impression. With my wider than average neck, at times it feels like it limits my movements and I can always feel the headset is there. In contrast, my Tone Ultra is quite flexible, lighter and I often even forget it’s around my neck when I am not using it. On the positive side, my colleagues seem to prefer the Tone Infinim’s more solid feel so there are two way to go about it. The silver, metallic color is certainly not my thing, I prefer the more inconspicuous black on my Tone Ultra. Another point against the more expensive Tone Infinim is that the cheaper LG Tone Ultra also has Ambient Noise Cancellation (ANC) built in. In all fairness, though, I have yet to hear ANC make a real difference on my Tone Ultra in the street or when riding in a car. I’m still willing to give it the benefit of a doubt, as I’ve never tried it on a train or a plane, where it’s supposed to shine. Nevertheless, stripping the HBS-900 of this technology would make you feel you are losing something while they would be paying 50% more for the HBS-900. It’s really an inexplicable decision by LG. Another thing I didn’t quite like is that there is no way of telling whether the aptX audio codec is used with the current source or not. That’s kind of a bummer for nerds like me, which love to enjoy the latest in tech. But perhaps that point should be made to smartphone manufacturers instead. Finally, on several occasions when using the Tone Infinim for phone calls, people couldn’t quite understand what I was saying, which has never happened before with my Tone Ultra. Of course, this conclusion is not scientific in anyway so take it for what it is – a brief real-life impression. The LG HBS-900 is a nice piece of kit, there is no denying that. If you’ve scored that deal where it comes free with the LG G3, I would guess you won’t even be reading this review. However, if you intend to pay cold cash for it, I would urge you to get one of the cheaper models in the LG Bluetooth headset lineup instead. The Tone Infinim certainly has got the ergonomics better. The On/Off slider is a lot easier to toggle and I use that quite often. The spring-loaded volume and playback controls are way easier to use than the controls on the Tone Ultra. The retractable earbuds are a real life saver as the magnetic earbuds on the HBS-800 rarely stay in place for more than a minute. However, let’s not forget that the Tone Infinim (HBS-900) is some 50% more expensive than the Tone Ultra (HBS-800) and their battery life and sound quality is give or take the same. Even now, when I have both on my desk, I still prefer taking the HBS-800 out with me, as its much lighter and its flexible neck band allows me to completely forget it’s there during the day.